I have enormous affection for this photo. Its impact is not immediate, so I am resigned to see it pick up a mediocre score. But I'm entering it anyway in the hope that one or two people will get the same response from it that I do. I really appreciate the extra comments that have popped up as a result of the "I really love my shot" thread. I can understand the ambiguity of the pose must have put some people off (even though it's one of a series of shots, I can't work out where the head is either!). 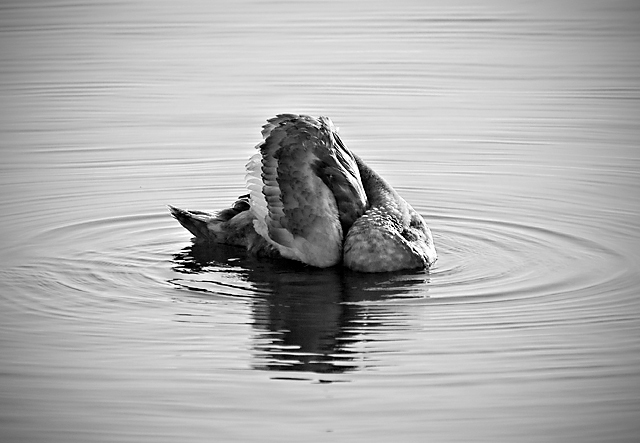 I hope that more people like than dislike the centred composition - I'm not a huge fan of rules for rules' sake and I thought the ripples coming out from the swan justified it. Wonderful photo. Unlike most of the voters, my only complaint is that the bird IS recognizable. Without the small tail giving away it's identity, this sea creature could have scored even lower, but would have been a better piece of art. Don't compromise your photography for a high DPC score unless you are doing it intentionally. I do think it is too centered. I agree that the ripples are nice, so the centering works great right to left. Maybe if a little bit of the bottom was cropped it would have a little more punch. I honestly wouldn't have known what this was without reading your description. I truly think this would have done much better if you could see the head. I really like the tone of this photo. The vignette is a nice, suttle touch as well. Great image, though I like the ripples and the reflection, I feel that the subject lost importance. Hmmm, I thought I commented during the challenge. I really like the tones here and the ripples. The interesting pose of the duck also works extremely well. It all leads up to a good picture. My only suggestion and it is quite minor would be to brighten up the duck just a bit while keeping the same contrast (I would like to see more of those whites). 6 from me. Like the B&W treatment. sorry but i gave this a 4 mostly because i couldn't figure out what it was! I liked this,during voting, but think maybe it wasn't understood by many of the voters. I think it worked very well in black and white, not sure that it would in colour. I like your centered composition. Great lighting and clarity. I like it in black & white - for me, its more effective. A little bit of darkness in all four corners (I'm sure there's a more technical term), but overall a nice photo. Just beautiful. Great BW conversion. Interesting curves and lines. I can almost imagine this is a sea monster or dragon if it weren't for the tail. A good photo, I like the water ripples, but the birds pose does not grab me. Complicated yet interesting. Would it be better in color though? I donno. whoa, when I first saw this on the thumbnail I thought it was a man kneeling. what an awesome capture, centered composition and all. Proudly hosted by Sargasso Networks. Current Server Time: 04/23/2019 12:21:32 PM EDT.